Here's a strange one. Not the fact that Saga are releasing a live double album, there have been many of those, but towards the end of 2015 German label earMUSIC announced an extensive re-master and re-issue campaign covering all Saga's studio releases from the last two decades. Issued in pairs, 'The Beginners Guide To Throwing Shapes' and 'The Security Of Illusion' came first, each containing bonus tracks from their Hamburg show in 2015. A few weeks later 'Generation 13' and 'Steel Umbrellas' followed, again with bonus tracks from the same show, but when the next two were due, just 'The Pleasure And The Pain' appeared, with no sign of the pre-debut sessions 'Phase One'. No further albums have been forthcoming and now the whole Hamburg show has appeared on the release schedule, a limited edition version of something that I was under the impression was only supposed to provide bonus tracks for a dozen re-issues. I don't mind this too much, it's one of their more interesting live releases, which in addition to featuring all the expected "hits" also includes a handful of rarely played gems and a couple of real surprises. Of late, Saga shows have Ian Crichton's scintillating guitar work louder in the mix at the expense of Jim Gilmour's keys, and that's somewhat the case here, but maybe not as blatantly as on some of their live recordings. The balance is just about perfect on the unexpected opening of '(Goodbye) Once Upon A Time' and 'Someone Should', neither of which have been aired much since their respective albums came out in the eighties. Similarly, 1979's 'Hot To Cold' is another half-forgotten gem from their quirky 'Images At Twilight' album sandwiched between the standards 'You're Not Alone' and 'On The Loose', although it's one of many tracks where Michael Sadler's commanding vocals are much louder than Gilmour's and the playing seems a bit messy. The rest of the first disc plays out with other unusual choices and recent songs; a slightly rough version of the 'Sagacity' Pop Rocker 'On My Way', Gilmour's turn in the vocal spotlight with a snippet of the unlisted piano ballad 'Not This Way' and his trademark 'Scratching The Surface', the anthemic 'Time To Go' and another song from last year, the contemporary brilliance of 'I'll Be'. Disc two is a bit more predictable with many Saga classics like 'Don't Be Late', 'Ice Nice' and 'The Flyer' taking things to a perfect sing-along ending, but besides a lengthy and rather unnecessary drum solo from Mike Thorne, the real surprise of this disc is the inclusion of the title track from 'Wildest Dreams'. The band have famously avoided playing any of the wonderful music on the two albums that Gilmour and original drummer Steve Negus weren't involved in, but here the underrated hi-tech Prog/AOR classic sounds totally wonderful and hopefully opens the door to more from that era, although I guess a complete run through of '...Shapes' is a pipedream I'll probably take to my grave. Well recorded and mixed (would you expect anything else from such accomplished studio cats? 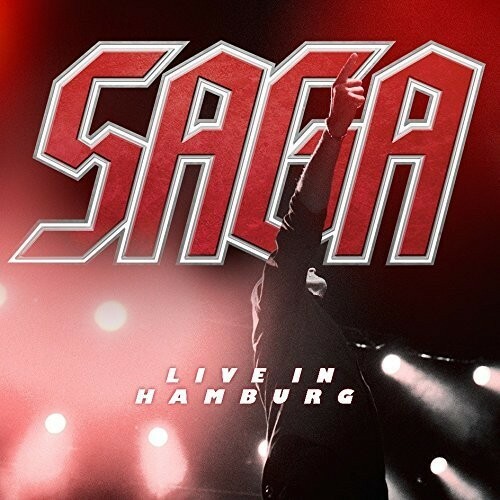 ), 'Live In Hamburg' is as good a set-list as any of their other live albums and shows what amazing players and writers they are and how much Sadler is the only vocalist who should ever front this great Canadian band.